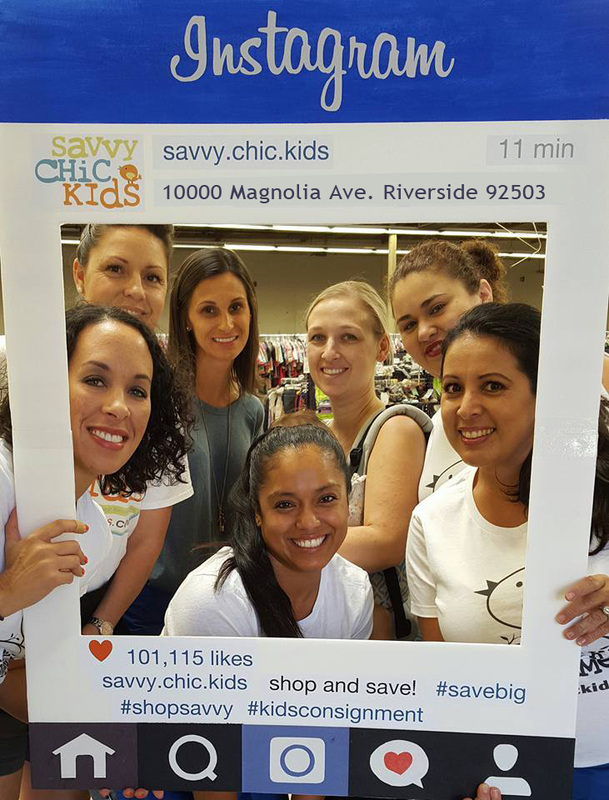 Savvy Chic Kids relies on its volunteers for a successful sale. As our sale events grow, so does the need for quality volunteer help. Volunteering is a fun and rewarding experience with many added benefits. Volunteers receive a shopping pass to our Private Pre-Sale as well as to the 1/2 Price Pre-Sale. The more you volunteer, the earlier you get to shop! Consignors who volunteer for ONE 4-hour shift will get an extra 5% back on their total sales. As a volunteer you will help check in products (you'll see what comes in first! ), arrange items on the sales floor, greet and assist customers, and help sort unsold items after the event (consigning volunteers who work the sort shift leave with their checks too!) Volunteering is fun and busy -- your shift will be up before you know it. Anyone can volunteer --Moms, Dads, Grandparents, friends. We especially need male volunteers during set-up and tear down, as there can sometimes be heavier lifting. Registered consignors are automatically eligible to volunteer at the sale. All consignors also get to pre-shop before the public dates, but those who volunteer get earlier entry into the Pre-Sale than consignors who do not volunteer. The more shifts you volunteer, the earlier you will get in to shop. Consignors who complete one 4-hour work shift will earn an extra 5% back on their total sales (70% instead of 65%). Please Note: Bringing an item (such as a table or supply item) can only be completed as a 2nd or 3rd shift and does not qualify for any additional earnings. You do not have to consign to participate as a volunteer at the sale. Non-consignors must register as a volunteer and complete their first shift before the Volunteer Presale. You will receive your shopping pass at the end of your work shift. *Please Note: Non-Consigning volunteers are not allowed to sign up to bring an item as their volunteer shift. This is a privilege reserved for our consignors. In order to achieve a high quality event, we count on our volunteers to fulfill their obligation and complete the shifts they sign up for. All volunteers must be on time and work their entire shift (unless released early by a sale owner) in order to receive the benefits. Please plan on arriving 10 minutes early to your shift so that you can check in and receive instructions as to your duties. If you must cancel a volunteer shift or reschedule, please do so as soon as possible. You can remove yourself from a shift and/or sign up for a new shift by logging in to the volunteer registration system until it's offline on the evening before drop-offs begin. Volunteers who do not follow through with their commitment will not be allowed to volunteer at future sales, which means no shopping at future presales. Should a genuine emergency arise after this date and you need to cancel your commitment with us, please let us know as soon as possible by sending us an email. Children are NOT allowed to accompany moms on their volunteer shifts, with one exception -- if you are a new mom who is able to help while carrying your young infant in a sling. Some jobs can easily be done with a baby on board and we will accommodate nursing/feeding breaks. If you are a new mom interested in volunteering, please let us know so we can assign you to one of these jobs. This policy has been created in order to maintain a high quality sale. We want to attract only those volunteers who are responsible and dependable. Please thoughtfully consider the commitment before you put your name down for a shift. Thanks for your consideration. Visit Little Bitty Prints at the sale and let Leigh Ann create custom handcrafted ceramic impressions of your little one's hands and feet!